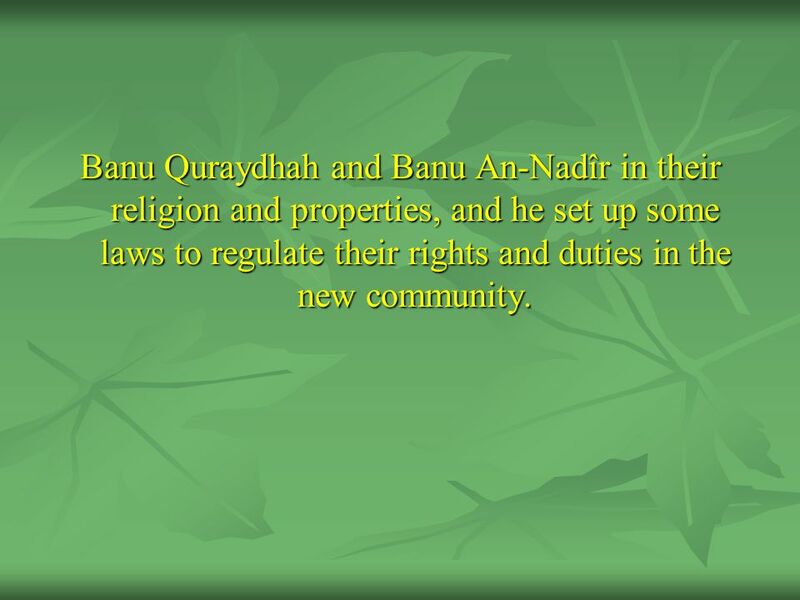 4 Banu Quraydhah and Banu An-Nadîr in their religion and properties, and he set up some laws to regulate their rights and duties in the new community. 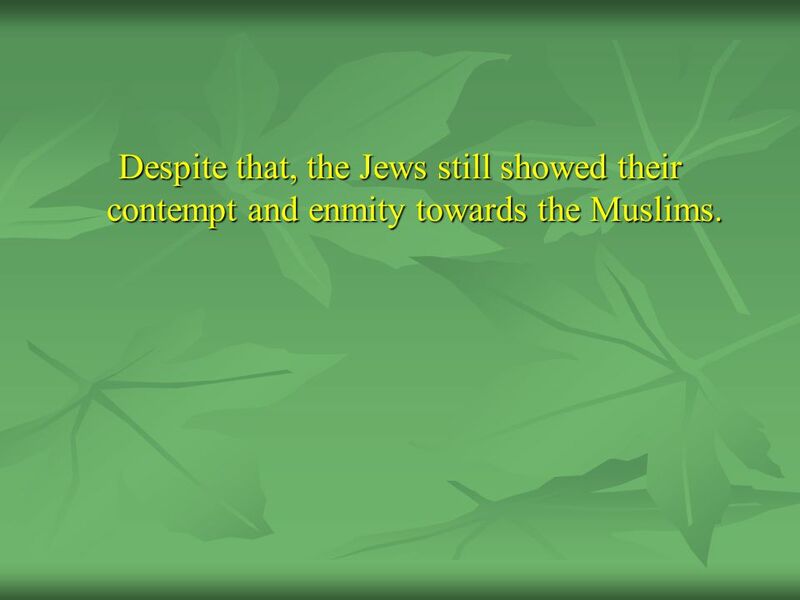 5 Despite that, the Jews still showed their contempt and enmity towards the Muslims. 6 Together with the hypocrites, they made a coalition against the new Muslim state. 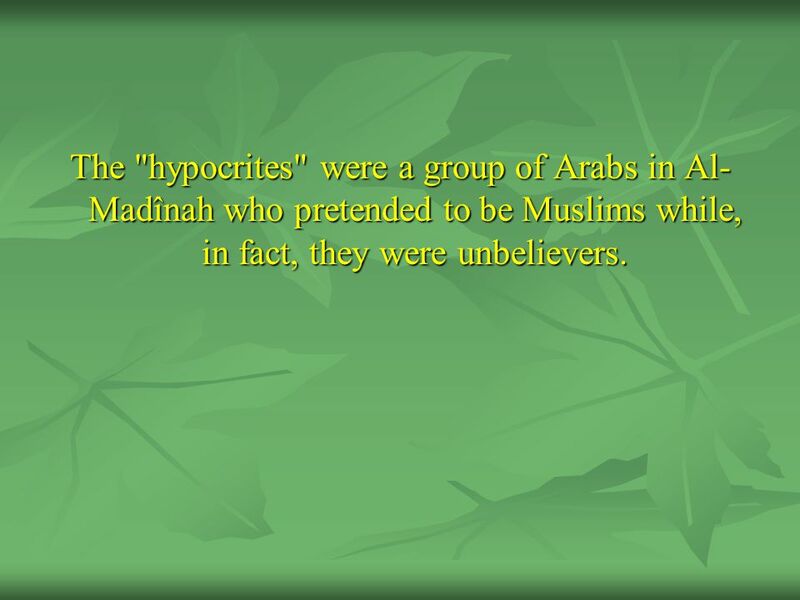 7 The "hypocrites" were a group of Arabs in Al-Madînah who pretended to be Muslims while, in fact, they were unbelievers. 8 They used to back enemies of Muslims, including the Jews who betrayed their Muslim neighbors. 9 The head of those hypocrites was `Abdullâh ibn Ubayy ibn Salûl. 10 Yet, the Prophet (SAWS) accepted the presence of these two groups (the Jews and the hypocrites) and did not fight them, nor did they fight him. 11 Instead, he used to counter their denial with irrefutable proofs and ultimate wisdom. 12 The Prophet (SAWS) never fought anybody to force them to embrace the religion of Allah, but he only invited them and argued with them to convince them with conclusive evidence and proofs. 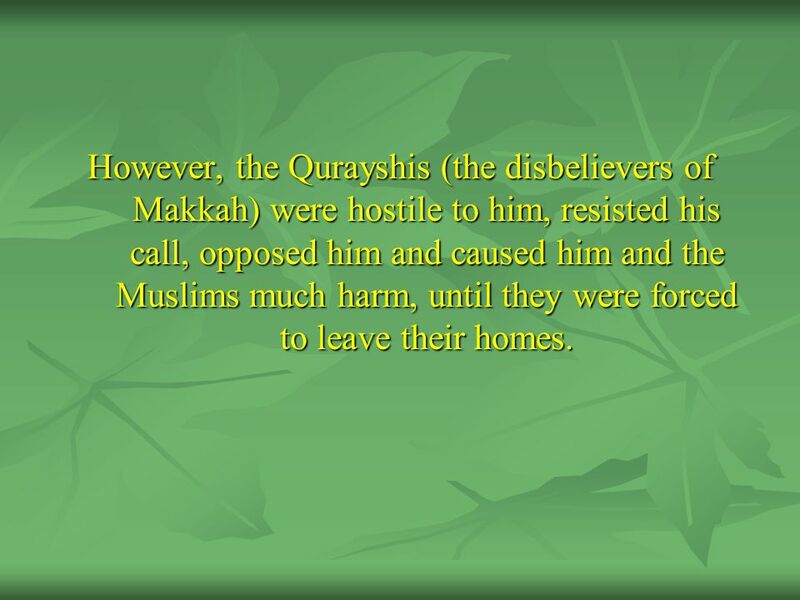 13 However, the Qurayshis (the disbelievers of Makkah) were hostile to him, resisted his call, opposed him and caused him and the Muslims much harm, until they were forced to leave their homes. 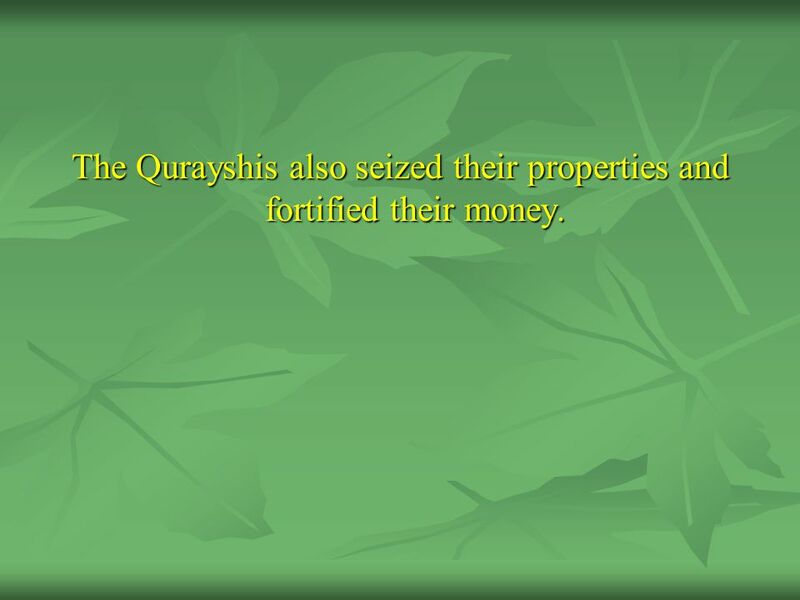 14 The Qurayshis also seized their properties and fortified their money. 15 The Qurayshis even continued to harm those left behind who were too poor to immigrate with the Prophet (SAWS) and his companions. 16 Therefore, Allah (SWT), because of all this, has permitted His Prophet (SAWS) to fight them, as well as any other aggressor or those who obstruct the spread of the call. 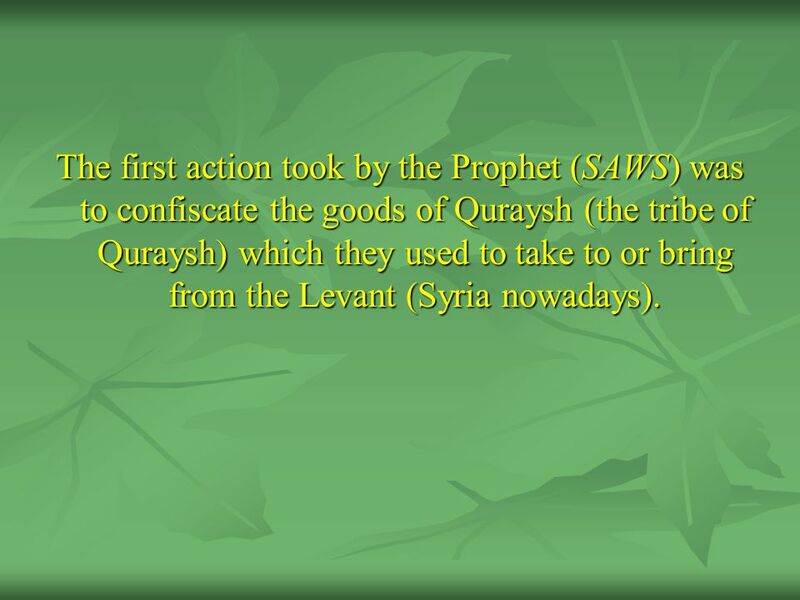 17 The first action took by the Prophet (SAWS) was to confiscate the goods of Quraysh (the tribe of Quraysh) which they used to take to or bring from the Levant (Syria nowadays). 19 he (SAWS) would himself go to fight along with the Muslim fighters, but sometimes he would send the fighters with a leader that he chooses for them. 21 while they called the mission where he had sent other leaders a "Sariyyah" (expedition). 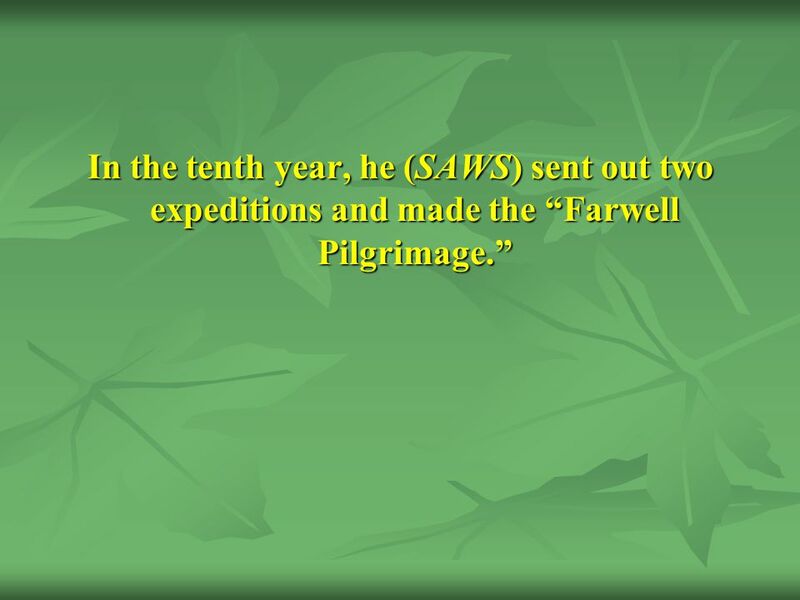 23 In the first year of the immigration (Hijrah), the Prophet (SAWS) sent out two expeditions. 25 Battle of Wadân: a village between Makkah and Al-Madînah. 26 He went out on this mission to intercept a caravan of Quraysh, only to find that they had got beyond his reach; so he returned. 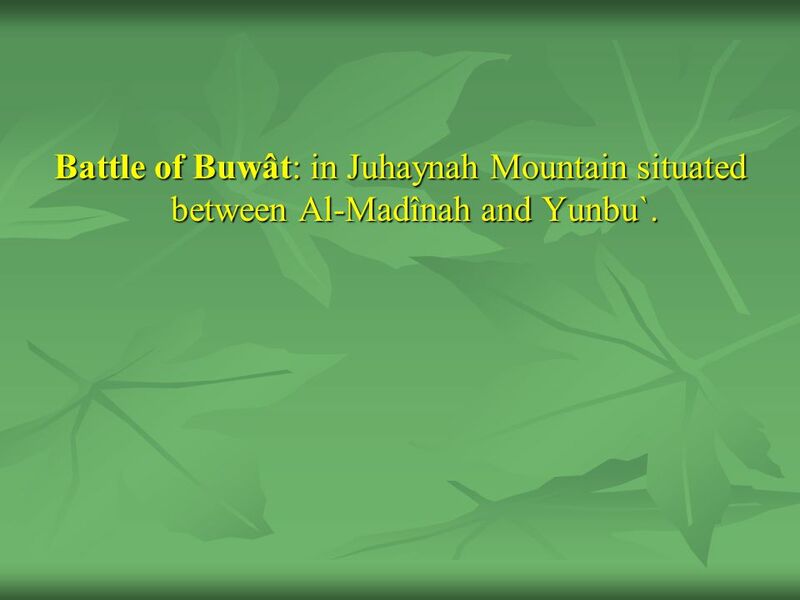 27 Battle of Buwât: in Juhaynah Mountain situated between Al-Madînah and Yunbu`. 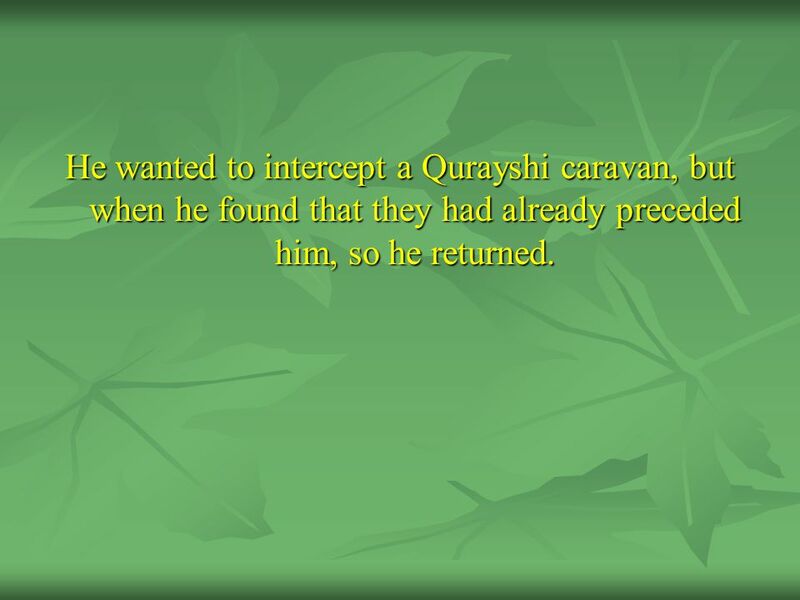 28 He wanted to intercept a Qurayshi caravan, but when he found that they had already preceded him, so he returned. Battle of Al-`Ashîrah: a place in the middle of Yunbu`. We will elaborate further when we talk about the Great Battle of Badr. 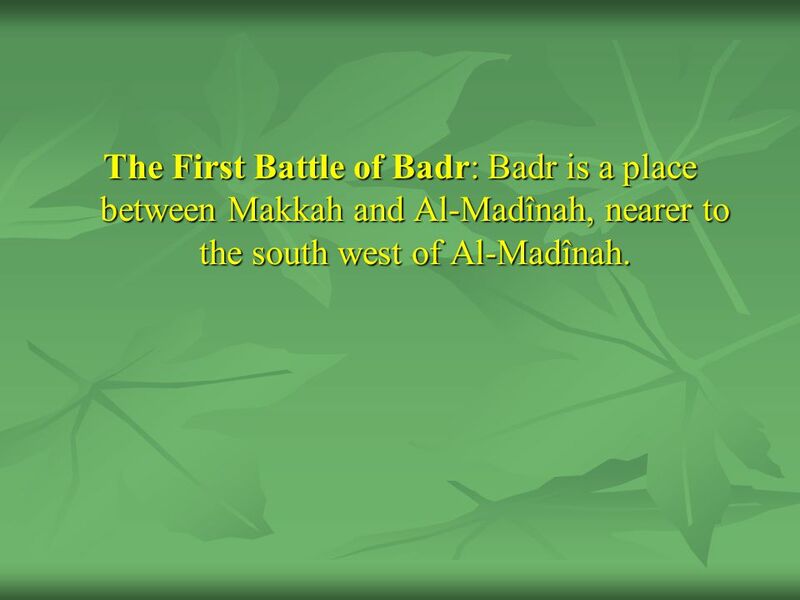 30 The First Battle of Badr: Badr is a place between Makkah and Al-Madînah, nearer to the south west of Al-Madînah. 31 He went out in pursuit of those who attempted to attack a suburb of the Al-Madînah, but did not find them. 32 The Great Battle of Badr: will be explained in details in the coming pages. 33 Battle of Banu Qaynuqâ`: They were a group of Jews around Al-Madînah who had breached the covenant of the Muslims and betrayed them. 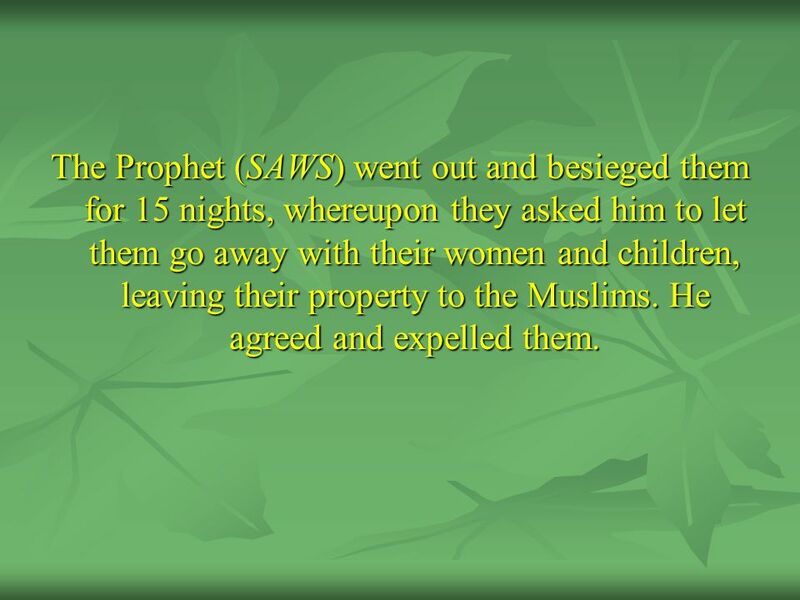 34 The Prophet (SAWS) went out and besieged them for 15 nights, whereupon they asked him to let them go away with their women and children, leaving their property to the Muslims. He agreed and expelled them. 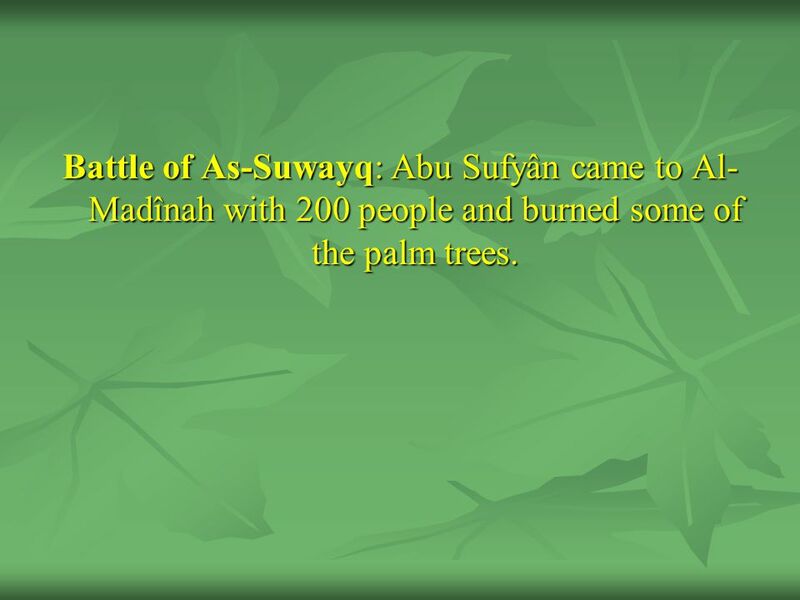 35 Battle of As-Suwayq: Abu Sufyân came to Al-Madînah with 200 people and burned some of the palm trees. 36 When the Prophet (SAWS) encountered them, they ran away leaving their suwayq (sacks of wheat and barley flour) behind. This is why it was called the battle of As-Suwayq. 38 Battle of Ghatafân: a branch of the tribe of Qays. 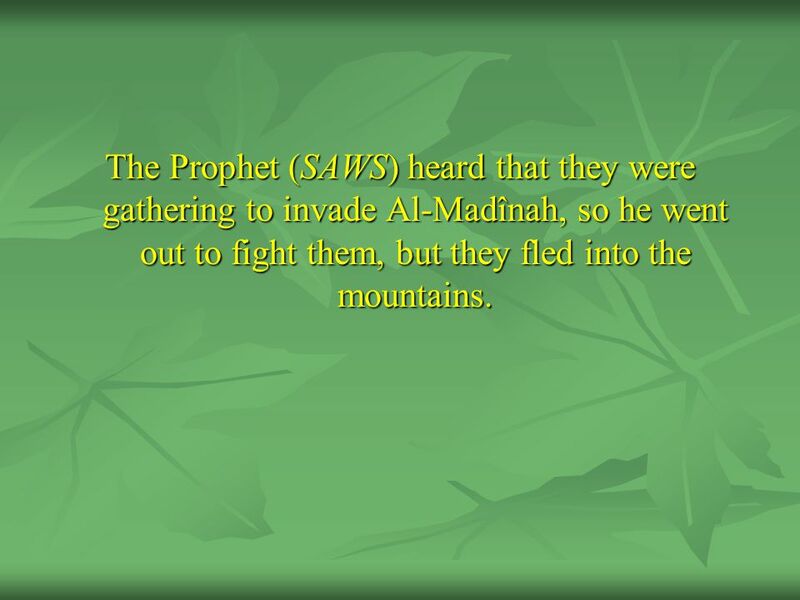 39 The Prophet (SAWS) heard that they were gathering to invade Al-Madînah, so he went out to fight them, but they fled into the mountains. 40 Battle of Bahrân: just outside of Al-Madînah where the tribe of Banu Sulaym lived. 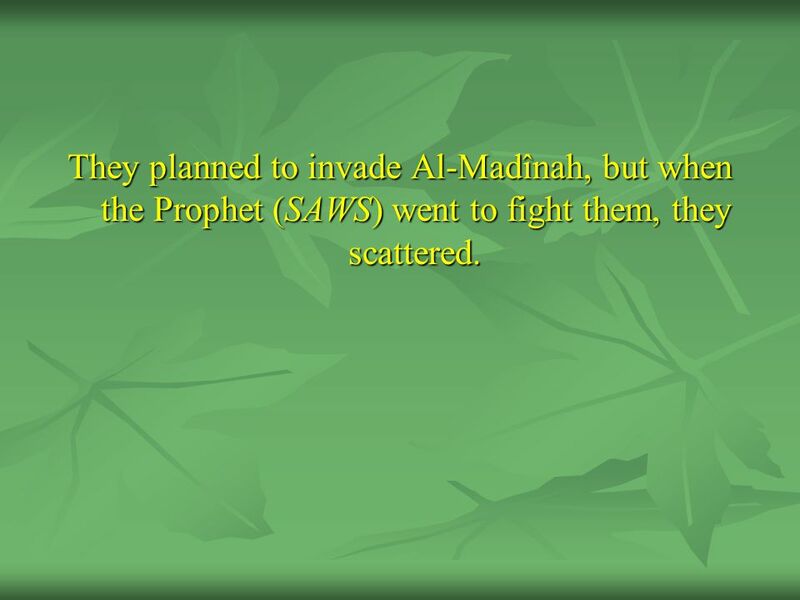 41 They planned to invade Al-Madînah, but when the Prophet (SAWS) went to fight them, they scattered. 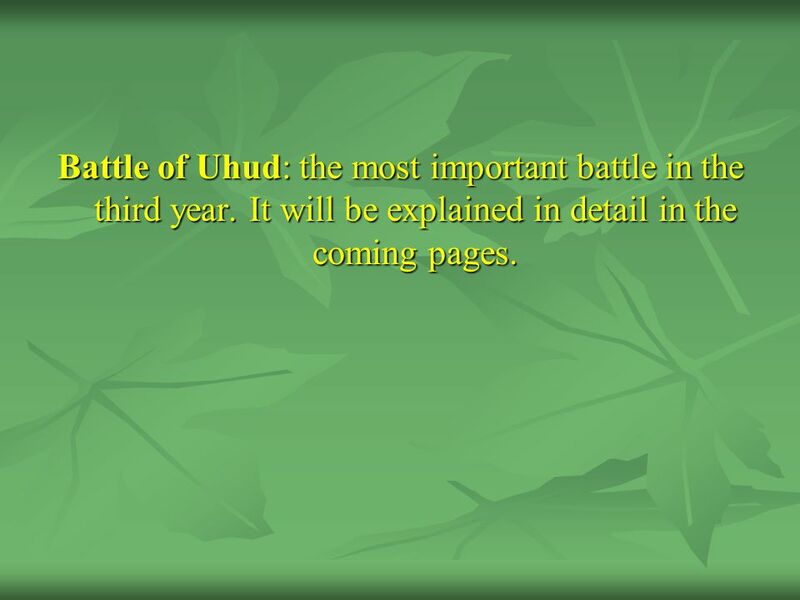 Battle of Uhud: the most important battle in the third year. It will be explained in detail in the coming pages. 43 Battle of Hamrâ' Al-Asad: also will be mentioned when describing the Battle of Uhud. 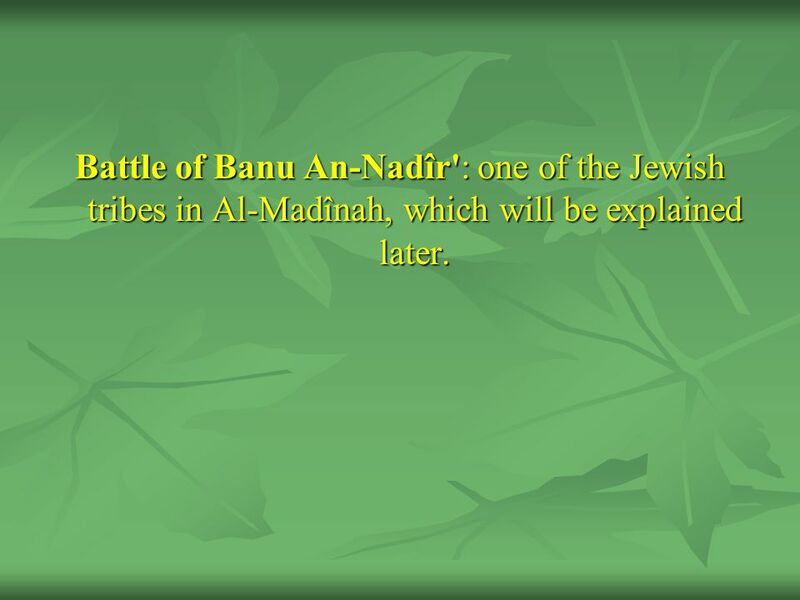 45 Battle of Banu An-Nadîr': one of the Jewish tribes in Al-Madînah, which will be explained later. 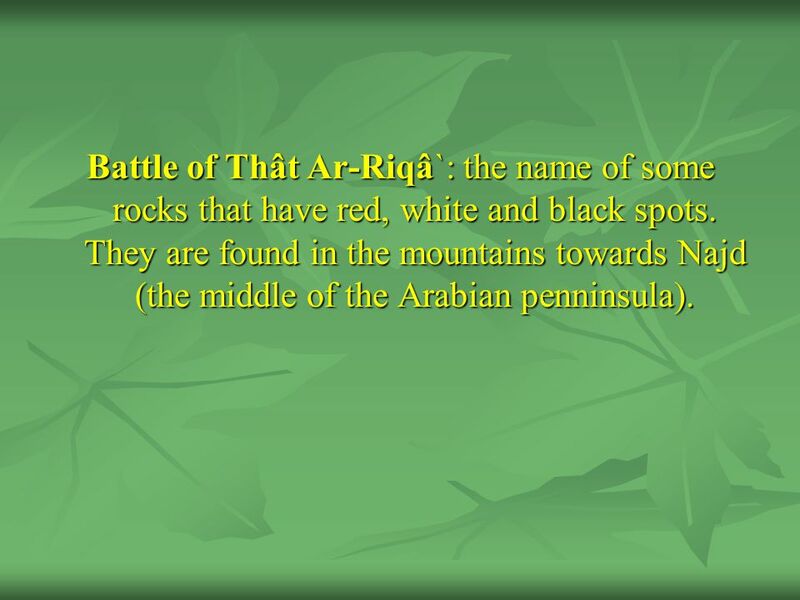 46 Battle of Thât Ar-Riqâ`: the name of some rocks that have red, white and black spots. They are found in the mountains towards Najd (the middle of the Arabian penninsula). 47 The Prophet (SAWS) was told that some of the Najdi tribes were preparing to fight him, so he went to meet them with 700 fighters. 48 When they got there, the men of the tribe fled to the mountains and left behind their women who were taken back as captives by the Muslims. 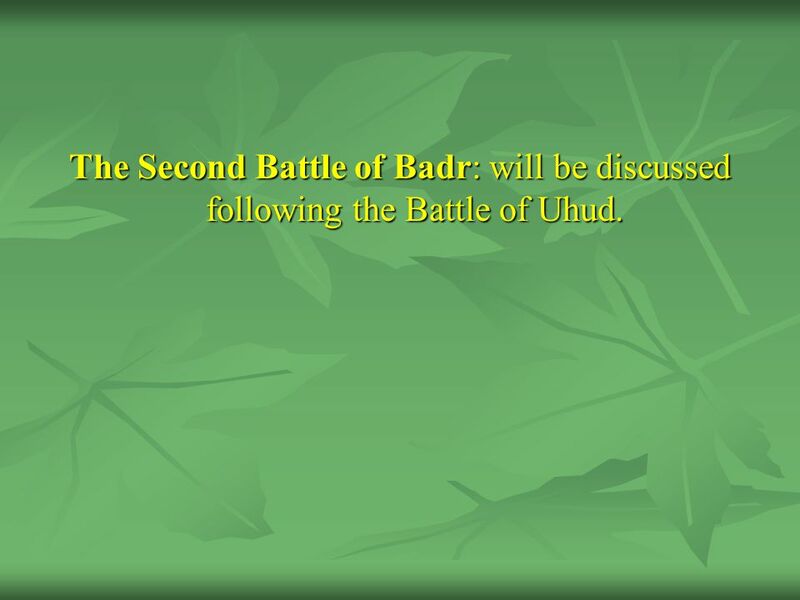 49 The Second Battle of Badr: will be discussed following the Battle of Uhud. 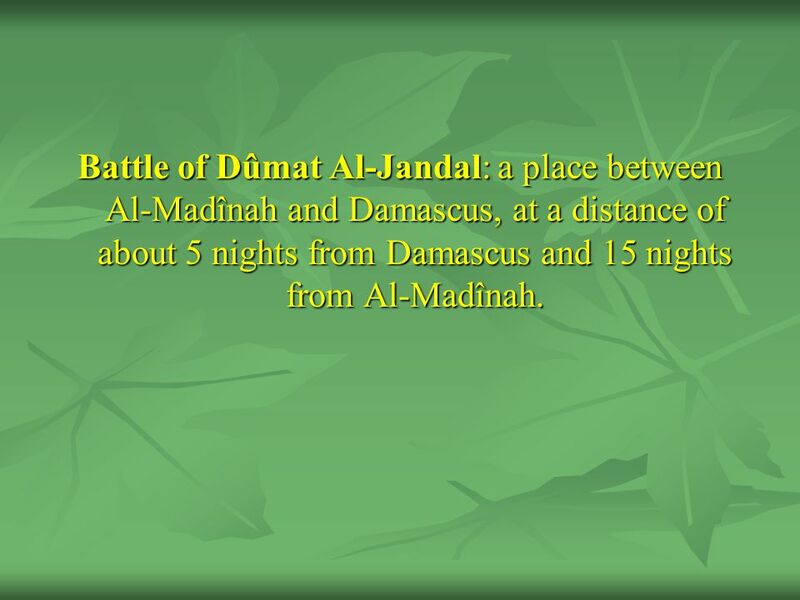 51 Battle of Dûmat Al-Jandal: a place between Al-Madînah and Damascus, at a distance of about 5 nights from Damascus and 15 nights from Al-Madînah. 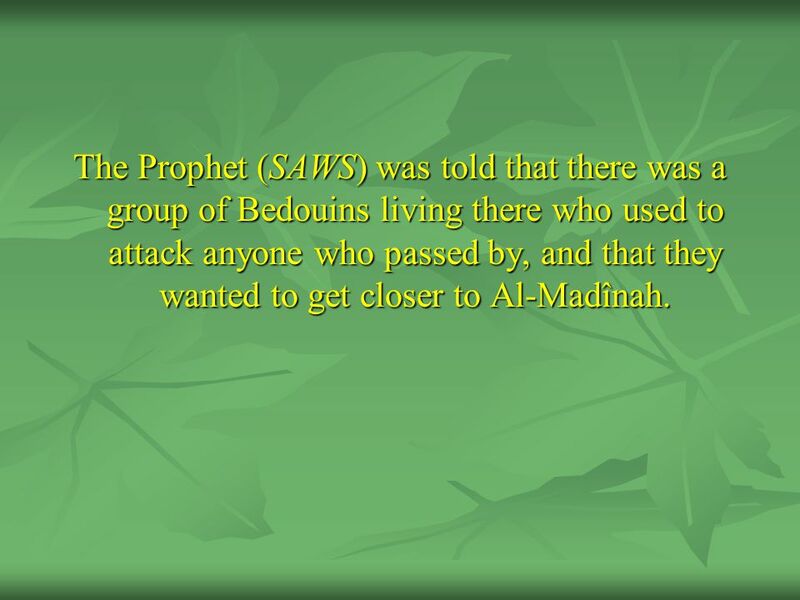 52 The Prophet (SAWS) was told that there was a group of Bedouins living there who used to attack anyone who passed by, and that they wanted to get closer to Al-Madînah. 53 He went out with one thousand fighters, but when they knew of his approach they fled away and left their cattle, which the Muslims took as booty. 54 Battle of Banu Al-Mustaliq: a branch of the tribe of Khuzâ`ah. 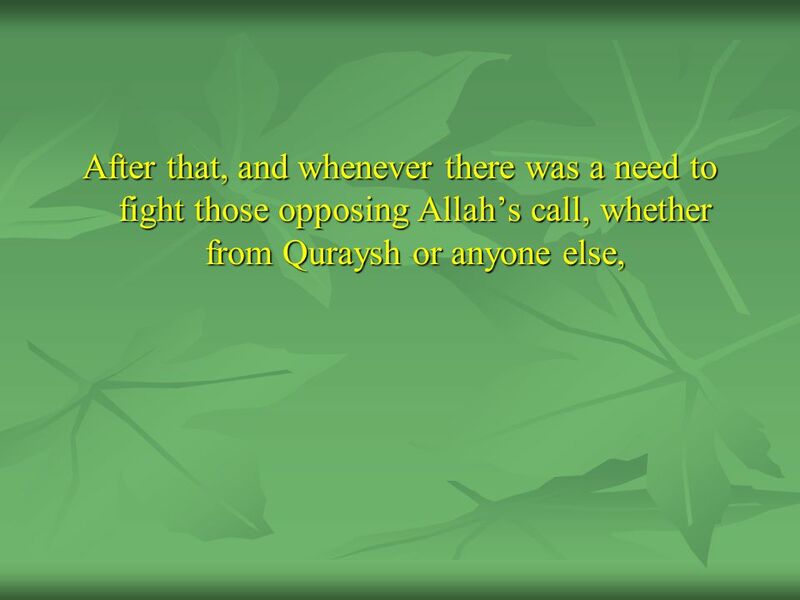 55 They assisted Quraysh in fighting the Muslims at the battle of Uhud, and then gathered to fight the Muslims by themselves. 56 The Prophet (SAWS) went out to meet them in a large group. 57 The two parties met at Al-Muraysî`, a spring owned by the Khuzâ`ah tribe. The unbelievers were defeated, with many dead and wounded. 58 The Prophet (SAWS), then married the daughter of their leader, Juwayriyah bint ul-Hârith, and freed all the women captives. 59 It is when the Muslims were returning from that battle, that the famous Ifk (false accusation) incident took place. 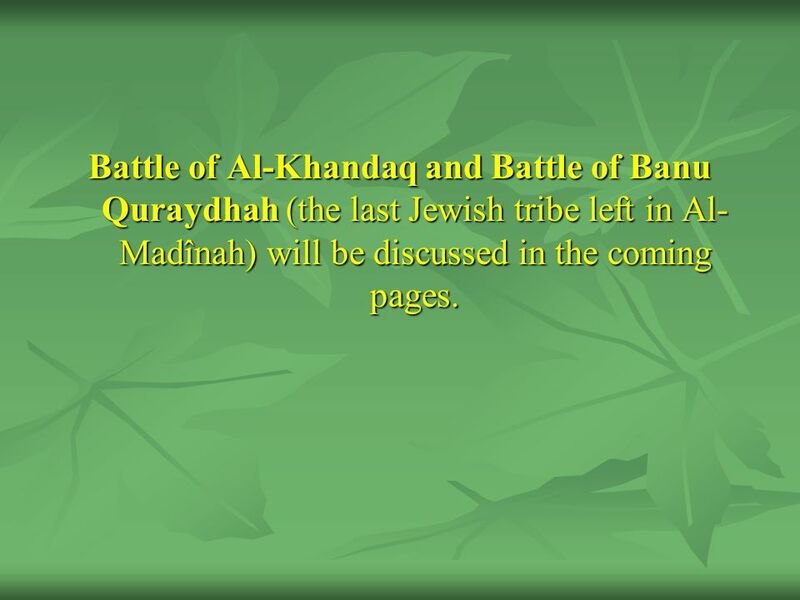 60 Battle of Al-Khandaq and Battle of Banu Quraydhah (the last Jewish tribe left in Al-Madînah) will be discussed in the coming pages. 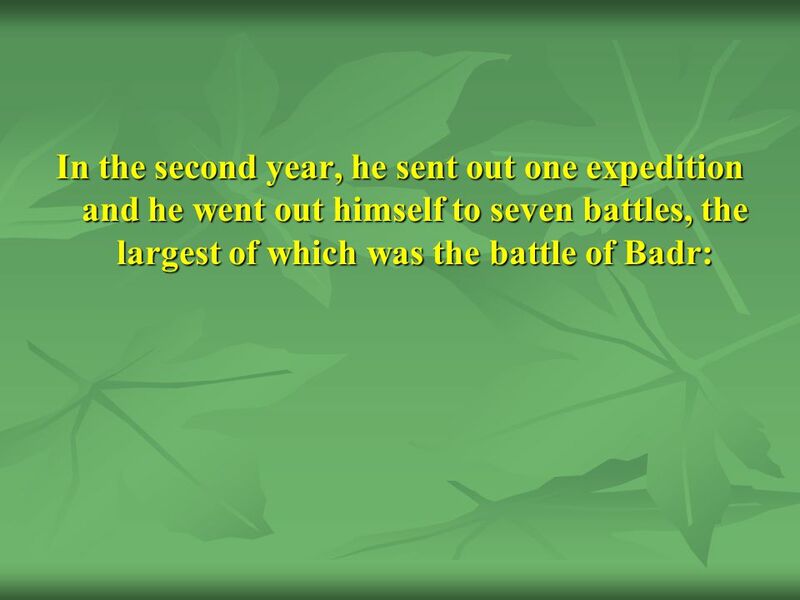 62 Battle of Banu Lihyân. Battle of Al-Ghâbah. 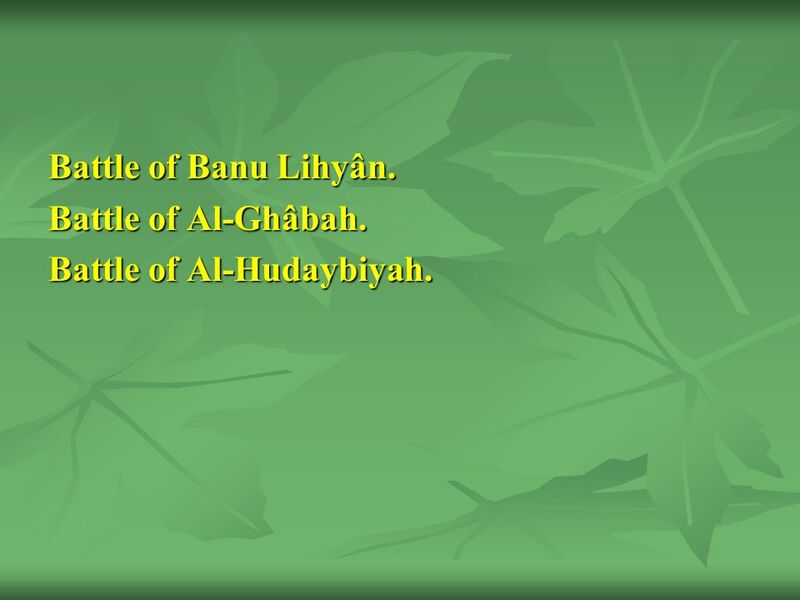 Battle of Al-Hudaybiyah. 63 In the seventh year, he (SAWS) fought one battle, which is the battle of Khaybar, and sent out 3 expeditions. 64 In the eighth year, he (SAWS) fought four battles, and sent out 10 expeditions. 65 Battle of Mu'tah. 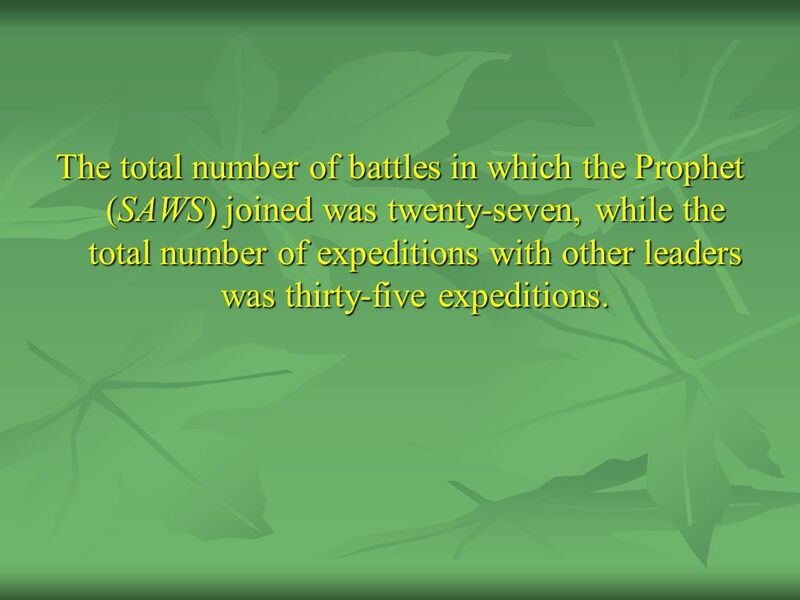 The Conquest of Makkah: the largest, most important battle in that year. 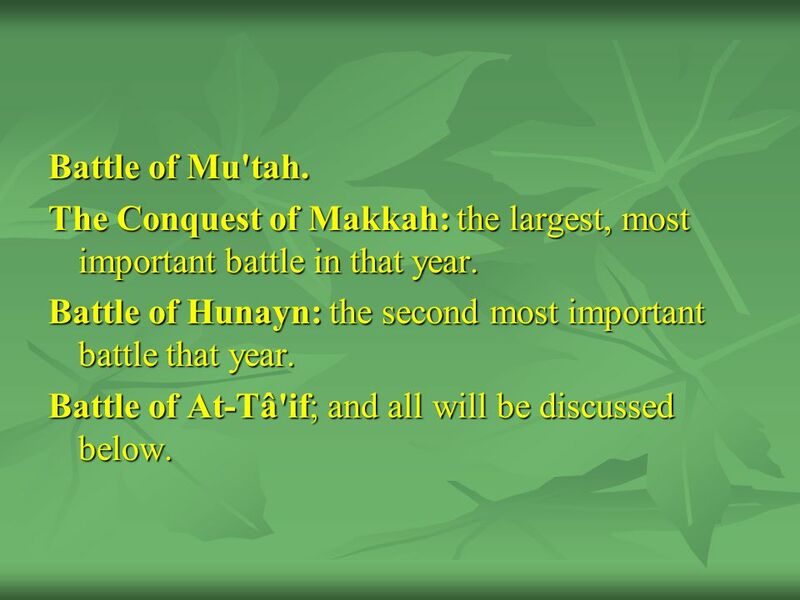 Battle of Hunayn: the second most important battle that year. Battle of At-Tâ'if; and all will be discussed below. 66 In the ninth year, he (SAWS) fought one battle (Tabûk), and sent out one expedition. 68 The total number of battles in which the Prophet (SAWS) joined was twenty-seven, while the total number of expeditions with other leaders was thirty-five expeditions. 69 Let us talk briefly about the most important battles. 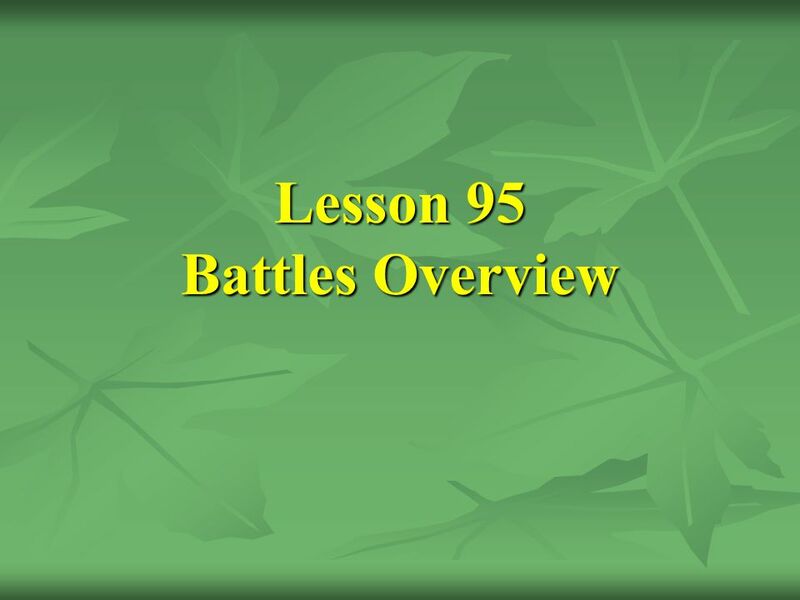 Download ppt "Lesson 95 Battles Overview"
Islam in Medina. Yathrib, which was later called Medina (the city), is revered world-wide as the Prophet's city. It is about 300 miles from Makka. The. Best Wishes In Ramadan From Ibrahim Memon. Some Ahadith On Ramadan. Diarmuid and Grainne The Chase Diarmuid and Grainne b b Fionn was leader of the Fianna. b b Cormac, High King of Ireland, was afraid that the Fianna. Lesson 93 Al-`Aqabah Pledges to Al- Isra’. The Prophet's offering his message to the tribes and the first pledge of Al-`Aqabah. 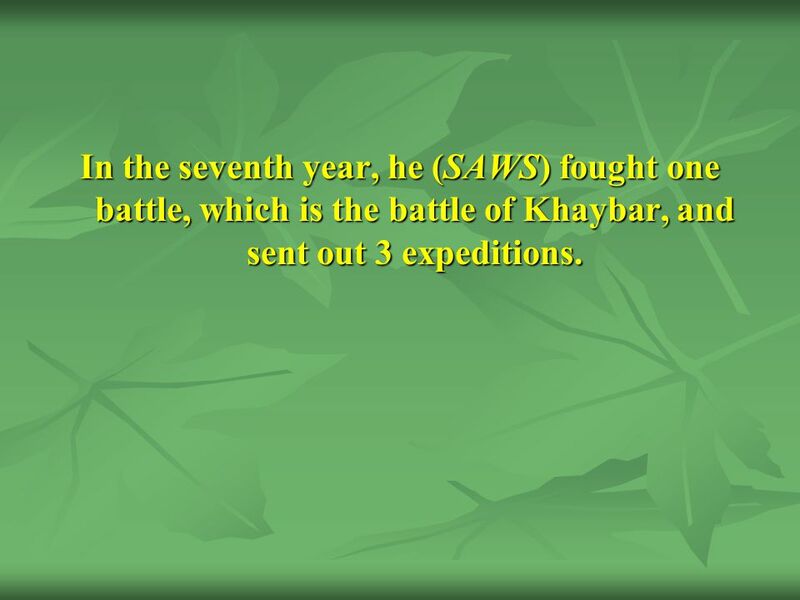 The Battle of Badr In the second year of Hijrat, a caravan of the kuffar of Makkah, under leadership of Abu Sufyaan, went to Syria. Sensing trouble, on. Birth to Message AD 40 years Mecca Phase AD 13 years Madina Phase AD 10 years Secret Phase AD 3 years Declaration Phase. Internment of Japanese Canadians. The bombing of Pearl Harbour by the Japanese had a huge impact on Canada:  Many people became worried about a possible. TARIKH CLASS 7 LESSON 14 THE BATTLE OF MOOTA Power point realized by a kaniz-e-Fatima Fi Sabilillah French version checked by Moulla Nissar Rajpar, Reunion. The Prophet Muhammad & The Beginnings of Islam Arabia Before Muhammad Makkah (Mecca):  Important trade stop and religious center of Arabia  People.